Creditors often hire collection agencies to get customers to pay their debts. There are guidelines that these collection agencies are legally bound to follow. When these guidelines are violated, it is considered harassment. The Federal Trade Commission (FTC) established The Fair Debt Collection Practices Act (FDCPA) to protect consumers from illegal debt collection practices. The following are steps you as a consumer can take if you believe these agencies are violating your rights. Determine if the collection agency is violating FTC/FDCPA guidelines. According to the FTC, collection agency violations include, harassment, making false statements or threatening with violence. File a complaint with your state consumer protection agency. Send a copy of your complaint to the creditor who hired the collection agency.The Federal Trade Commission works for consumers to prevent fraudulent, deceptive and abusive business practices. To file a complaint visit http://ftc.gov, or call 1-877-FTC-HELP . Always keep a hard copy of any correspondence for your personal files. Send these letters through certified mail for proof that the collection agency received them. Contact your attorney general’s office to find out what your state’s debt collection laws are. If you feel that the debt collector has violated these laws, let the attorney general know. Review the FTC rules carefully. Give yourself peace of mind. 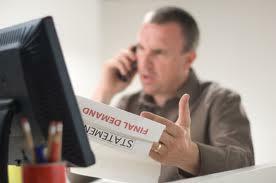 Arm yourself with knowledge to deal legally with harassing debt collectors. Debt collectors take matters much more seriously when a lawyer is involved.